From BCN Airport take a taxi ( ~30EUR, ~30min) and direct the driver to the crossing carrer Dulcet with carrer Sor Eulàlia d'Anzizu. Send the form in this link to get UPC hotel rates (otherwise, it won't apply). 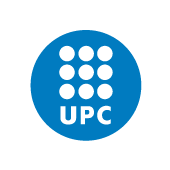 Hotels Arenas, Bonanova Park and Sansi Pedralbes are nearby, but please check whether they apply UPC rates for your travel dates in the Accomodation Form indicated above.